Annette Adams, MSW, MSB, LCSW is a parishioner at St. Anthony of Padua (The Woodlands) and works in our Padre Pio office in the Spring / Woodlands area. She has experience in outpatient and inpatient settings, and expertise in healthcare administration. She provides services for individuals and couples. Sara Alexander, MA, LPC is a native of Bay City (Texas) and has a master's degree from Houston Baptist University. Her undergraduate degree was from Franciscan University in Steubenville (Ohio). She and her husband have been very involved with ADORE ministries, and she previously worked as a Catholic school counselor. They have four children and are parishioners at St. Thomas More. She is currently out on maternity leave. Stephen Bonnette, MS, LPC comes to us from Louisiana with his master's degree from University of Louisiana at Lafayette and his undergraduate Psychology degree from LSU at Alexandria. He teaches full-time at San Jacinto College. He has been involved in Steubenville conferences as a youth counselor and has served in a variety of peer/youth ministry and leadership roles at a number of Catholic parishes. Married with young children, they are parishioners at St. Clare of Assisi. Stephen works in our Mother Cabrini office in the NASA / Clear Lake area where he works with adults. He has special training for marriage counseling. Steven Brown, MS, LSSP, LPA has a license and a wealth of experience in school psychology. He comes to us from the Dallas area, where he worked for several school districts during his career there. After relocating to Houston, he and his wife became parishioners at St. Laurence in Sugar Land. He volunteers at the parish assisting children with disabilities in their faith formation programs. At the parish he also assists with the PACT program, which is a ministry devoted to the parenting of teenagers. He works under the supervision of Dr. Ken, mainly seeing children and adolescents at the Thérèse office in the Stafford / Sugar Land area. Psychologist Dr. Kenneth Buckle, Psy.D. is the Founder and Executive Director of Gratia Plena. He is a native Houstonian and is licensed to practice Psychology in Texas. Dr. Ken obtained his undergraduate degree in Psychology from the University of St. Thomas in Houston. He then completed his graduate studies in the Chicago area. He and his wife are parishioners at St. Laurence (Sugar Land). He works in the Thérèse office in the Stafford / Sugar Land area and sees mainly adults but some adolescents in crisis, addressing mental illness and addictions. Business Manager Melanie Burrhus has a degree in psychology from UT Austin and did some graduate work in counseling at the University of Houston. She and her family are parishioners at St. Laurence in Sugar Land but are also involved at St. Faustina parish in Fulshear. She works in our Thérèse office in the Stafford / Sugar Land area and supervises our receptionists and all of the day to day administrative issues for Gratia Plena. She serves as Secretary on our Board of Directors. LPC Intern Derlyn Rhoades Cayanan, MA is a native of Hawaii, and obtained her undergraduate and graduate degrees from Franciscan University in Steubenville, OH. She is supervised by Kelly Guidry, LPC-S and by Dr. Ken. Derlyn works in our Padre Pio office in the Spring / Woodlands area and in New Caney at St. John of the Cross parish. She and her husband are parishioners at St. Anthony of Padua in The Woodlands. Tim Cullen is Director of Marketing and Development for Gratia Plena. He and his wife are parishioners at St. Laurence (Sugar Land). Tim is also studying at St. Mary's Seminary for the permanent diaconate. He offices at the Thérèse office in the Stafford / Sugar Land area. LPC Intern Corey Dossey, MA has her counseling degree from Sam Houston State University and undergraduate degree in Psychology from Texas A&M. She is a parishioner at All Saints in Houston. She has experience in play therapy with children and has worked for several nonprofit organizations. She is supervised by Shannon Carroll, LPC-S and by Dr. Ken. She works part-time in our Cecilia office in the Memorial area. Pui Au-Earls, M.Ed., LPC obtained her master's degree in counseling at the University of St. Thomas. Pui is originally from Hong Kong, but her college education was in the United States. She served as a FOCUS missionary. She is fluent in English and speaks Cantonese and some Mandarin Chinese. She is Catholic and married. She see adults and adolescents in our Mother Cabrini office but is out on maternity leave. Renee Fauria, Ed.D., MA, LPC-S is a parishioner at Sacred Heart (Conroe) and teaches graduate classes at Houston Baptist University. She has worked as a crisis pregnancy counselor and has experience working in hospital and outpatient settings. Her doctoral degree in Education is from Sam Houston State University and her master's degree in counseling is from the University of Chicago. She works part-time in our Padre Pio office in the Spring / Woodlands area. Christina Garcia, MS, LPC is a parishioner at the Catholic Charismatic Center in Houston, and she works in our Mother Cabrini office in the NASA / Clear Lake area. She sees adolescents and adults and has worked in hospital settings as well as with Catholic Charities. Her master's degree is from the University of Houston at Clear Lake. Office Assistant Leticia Garcia is one of our bilingual receptionists, and helps with administrative issues in the office. She and her family are parishioners at St. Laurence (Sugar Land). She works in the Thérèse office in the Stafford / Sugar Land area. Office Assistant Jazmin Gonzalez is one of our bilingual receptionists, and helps with administrative issues in the office. She is a parishioner at St. Luke the Evangelist, and works in the Mother Cabrini office in the NASA / Clear Lake area. School Psychologist Dr. John "Jay" Glynn, Ph.D. is a school psychologist (LSSP) who works mainly with adolescents and children. He obtained his Ph.D. in School/Child Clinical Psychology from the University of Texas at Austin. He has worked for many years in the past for the Cy-Fair and Fort Bend School Districts, but currently is on staff full-time at The Kinkaid School. He is also a certified Spiritual Director, trained through the Spiritual Direction Institute at the Cenacle in Houston. He is originally from New Orleans. He and his wife are parishioners at St. Laurence Catholic Church. He works part-time in our Thérèse office in the Stafford / Sugar Land area. Sr. Megan Grewing, CDP, MS, LPC is of the Congregation of Divine Providence, and relocated to Houston from San Antonio. She obtained her master's degree in counseling from Angelo State University. She is a parishioner at St. Rose of Lima in Houston. Sr. Megan sees people of all ages at the Cecilia office in the Memorial area. Spiritual Director Mary Kay Malicki, MS provides spiritual direction services for Gratia Plena and consultation to the Catholic community for Days of Reflection and retreats. She is a retired Catholic school teacher. 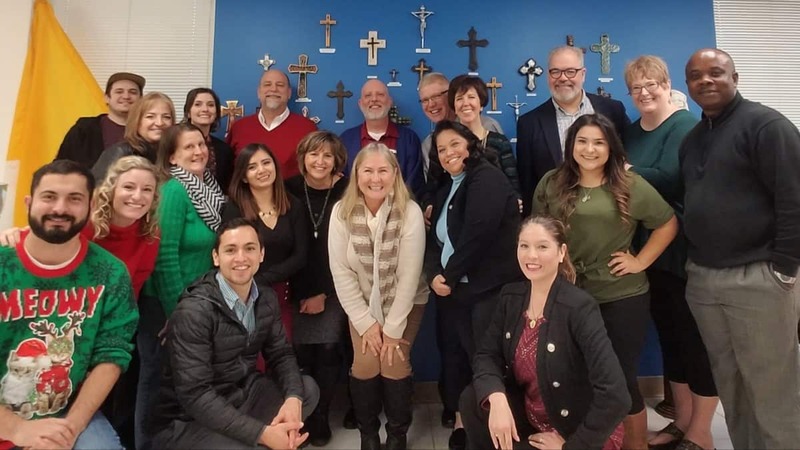 She received her spiritual direction training at the Spiritual Direction Institute at the Cenacle in Houston with specialized training in Italy, and is a member of Spiritual Directors International. She has 20 years of experience as a spiritual director. She has a master's degree in Chemistry and worked in her early years as a research chemist. She is Catholic and married with four adult children. She and her husband are parishioners at St. Catherine of Siena. More information about spiritual direction is available in the "Our Services" section of this website. She meets with directees at our Cecilia and Thérèse offices. LMFT Associate Lauren Novak, MS is a parishioner at St. Laurence (Sugar Land). her graduate degree is from the University of Houston at Clear Lake, and her undergraduate degree is from Texas Tech. She enjoys working with children and teen students. She works part-time at our Thérèse office in the Stafford / Sugar Land area. Fr. Solomon Ohiri, M.Ed. is a diocesan priest from Nigeria. He works as a pastoral counselor with Gratia Plena and is in residence at St. Nicholas parish downtown. He obtained two master's degrees from the University of St. Thomas and is working on a doctoral degree. He works in our Thérèse office in the Stafford / Sugar Land area, and has a special area of interest in men's issues. LPC Intern Cynthia Renaudo, MS and her husband are parishioners at St. Clare of Assisi and very involved in Rachel's Vineyard in Houston as President, organizing and leading retreats for post-abortive women. She has many years of experience in nonprofit operations and leadership. Her graduate degree in counseling was from the University of Houston at Clear Lake. She is under the supervision of Dr. Julie Jones LPC-S and Dr. Ken. She works full-time in our Mother Cabrini office in the NASA / Clear Lake area. Armando Tovar, MA, LPC is originally from California. His undergraduate and graduate degrees were from Franciscan University in Steubenville, OH. He attends Mass at St. Vincent de Paul parish and is working on his doctoral degree. He sees adults in our Thomas Aquinas office in the downtown / midtown Houston area. Office Assistant Noelia Valdivieso was born in Bolivia and is fluent in English and Spanish. She and her family are parishioners at St. Laurence (Sugar Land). She is a student at HCC. She works at our Thérèse office in the Stafford / Sugar Land area and helps with administrative duties. She and her family are active in the Sanacion de la Familia ministry which meets at the Houston Catholic Charismatic Center.